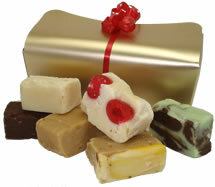 Choose up to SIX different varieties of fudge. If you choose more, then the first SIX will be selected. Options for Gift Wrap, a Greetings Card and Rose Decorations are at the checkout.